Buy this item and earn 1,629 ClubPoints. UNIMUX™ USB Matrix KVM switch allows up to eight users to individually command or simultaneously share up to 32 USB computers. Access USB-enabled PC, Sun, and Mac computers using USB keyboards and mice, and VGA multi-scan monitors. USB host computers and USB devices can be hot-plugged or removed at any time. UNIMUX™ USB Matrix KVM switch allows any USB device (keyboard and/or mouse) to control any attached USB host computer. International keyboard layouts are supported in auto-detection mode, or can be manually selected via the On Screen Display (OSD) menu. • Equipped with OSD, Liquid Crystal Display, and RS232. • Dedicated microprocessors prevent computers from locking up, ensuring reliable control. • Fully compliant with USB standards (1.0, 1.1). 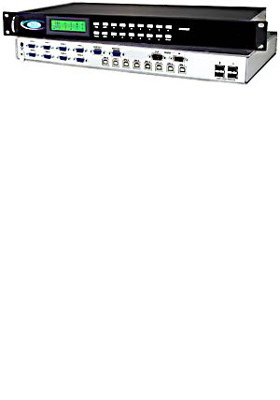 • Advanced OSD user interface with password security makes the UNIMUX USB Matrix KVM Switch simple and reliable to use in Enterprise data centers. • Computers can be shared or used exclusively. • Crestron® compatible. Module controls routing, reset and status RS232 functions. Listed below are additional products to consider which are compatible with UNIMUX USB Matrix, 4-Users, 8-Ports. These items may be required to complete your system. Copyright © 2019 KVMGalore® - All rights reserved. KVMGalore, and the KVMGalore logo are registered trademarks of Rackit® Technology Corporation. Tech Solutions Made Easy is a trademark of KVMGalore®. All other marks are property of their respective owners.